Hello, friends! Happy Valentine’s Day!! Back in 2014, I was a guest writer for the Northern Lights Greyhound Adoption Dog Blog. 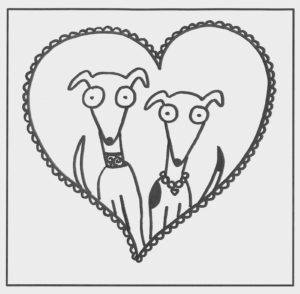 Each week, I would contribute a greyhound-related poem and corresponding illustration to the blog in an effort to support Northern Lights Greyhound Adoption, an organization dedicated to finding kind and loving forever homes for retired racing greyhounds. Since this is an organization (and cause!) that I’m incredibly fond of, I thought it would be fun to share some of my poetry with you in a special segment called Greyt Words! How Do I Love Greys? How do I love Greys? Let me count the ways. I love their depth and breadth and height. I love their lanky legs. with barks and grunts and yips. when Milkbones meet their lips. I love the way they make me laugh. I love their ideal grace. I love the way they love to run. I love the way they race. for as long as I shall be.